Suddenly without warning, a black bull bolted into the arena from a gate, followed by 4 young razetour men dressed all in white. 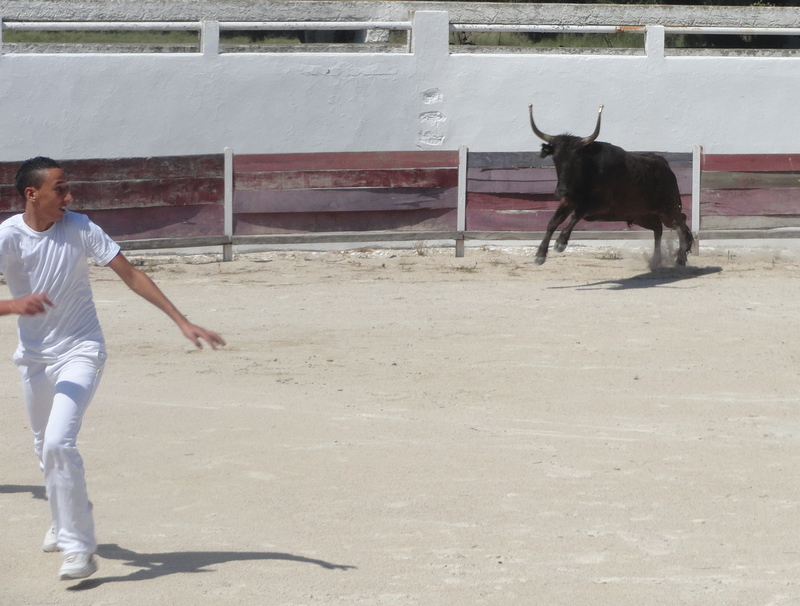 And thus began the 45-minute bullfight, the French way. And the bull was mad and hollering and foaming at the mouth and ready to kill. And when he spotted one of those razetours who was calling and tormenting, he charged full speed after him. But he couldn’t catch him because the man had jumped the 40-inch high fence inside the arena and was hanging on the 7-foot high arena wall. So, the bull had to stop suddenly from his full throttle charge or crash into the 40-inch high red fence. The bull was fairly slender and young with white horns sticking straight up. A gold metal cap was on the tip of each horn. The Lauren Family in the Camargue delta region of South France breeds these bulls to be mean and they have won many awards on the quality of their bulls. 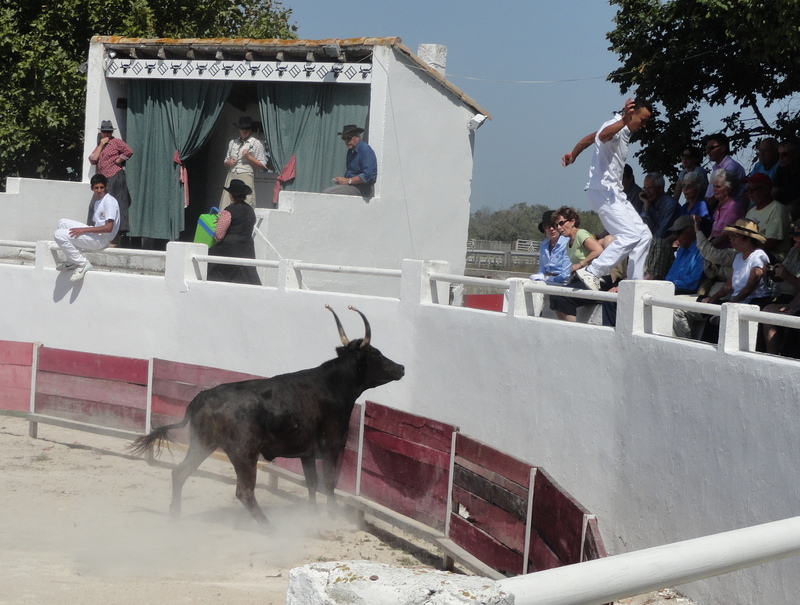 And this bullfighting, French style, has been going on since the 1700’s and the object was for a razetour to get a rosette off one of the bull’s horns in 15 minutes. After missing a razetour, the bull huffed and puffed around the arena and spotted another razetour and gave a full speed chase for him. But again, he disappeared from the arena and was hanging onto the arena wall. 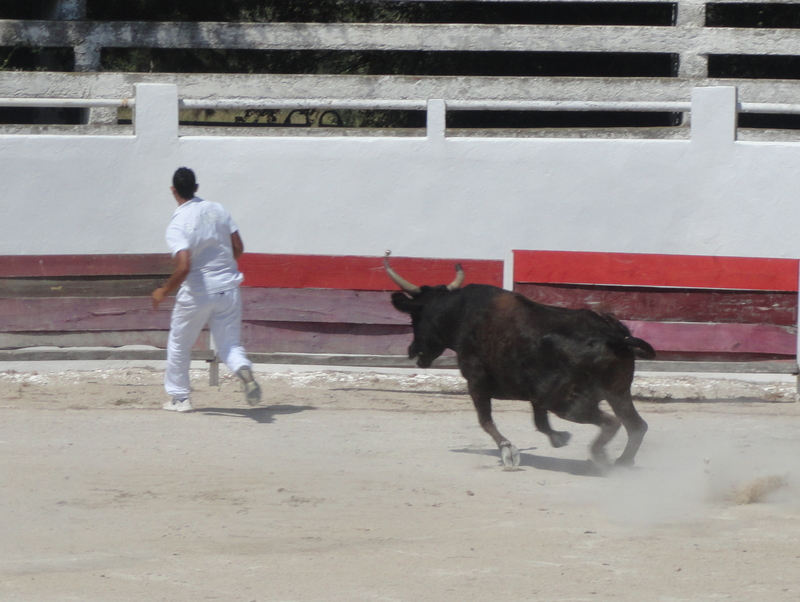 Now, the bull was really hollering and huffing and puffing and found another razetour and chased him. 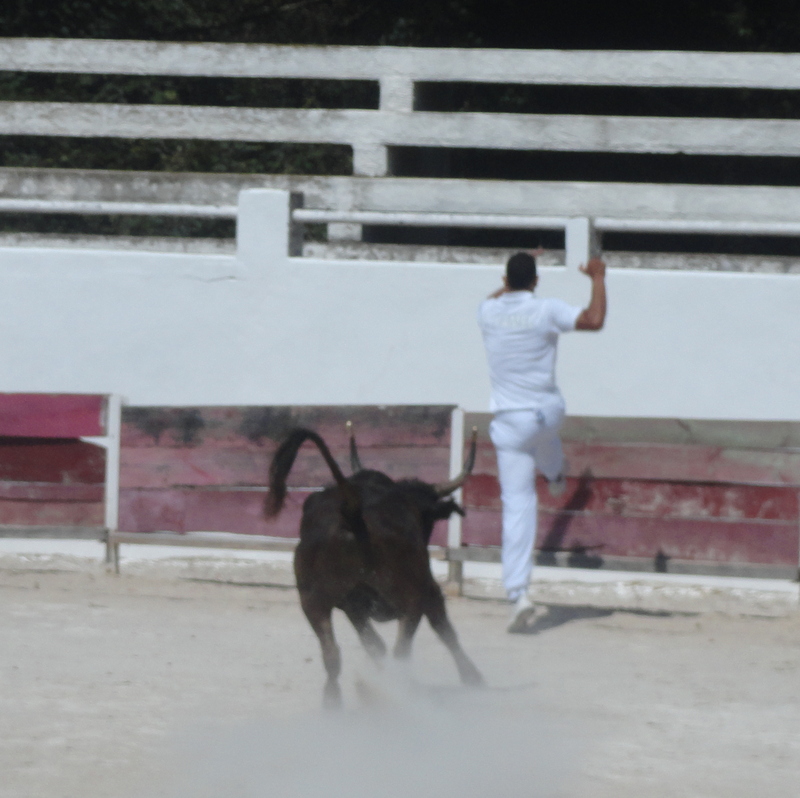 This time, the bull nearly caught him. And the crowd was cheering and screaming but didn’t know if the razetour would clear the fence this time. But he did and the bull stopped at the fence. Now, the bull was tired as he has chased all 4 razetours and lost so he left the arena, alive to see another day because the French don’t kill the bulls. Then, in bolts another new, fresh bull that was hollering and pawing the ground so hard he made a cloud of dust. And he was mad and went after the first razetour he saw. 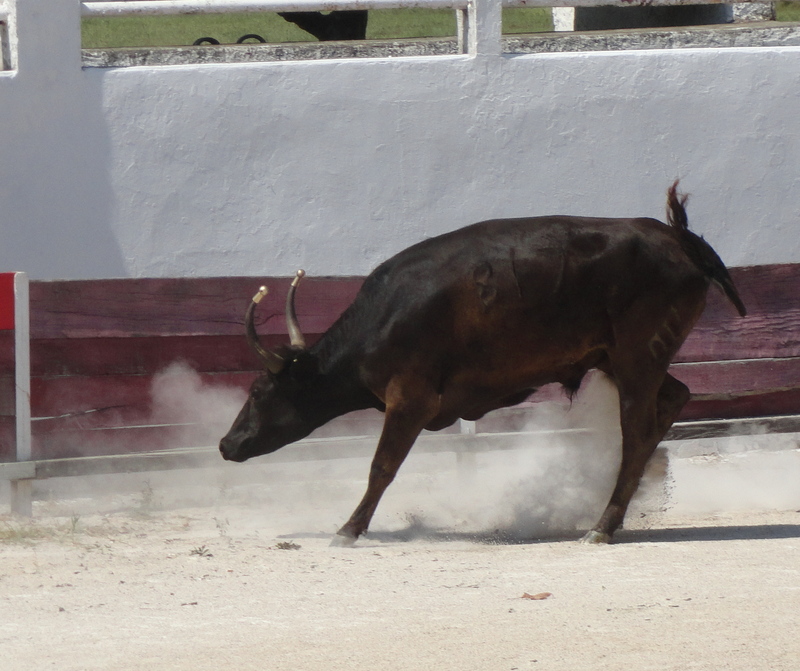 In fact, a lady in the crowd was standing at the upper fence taking photos and this bull went after her until he realized she wasn’t the enemy. 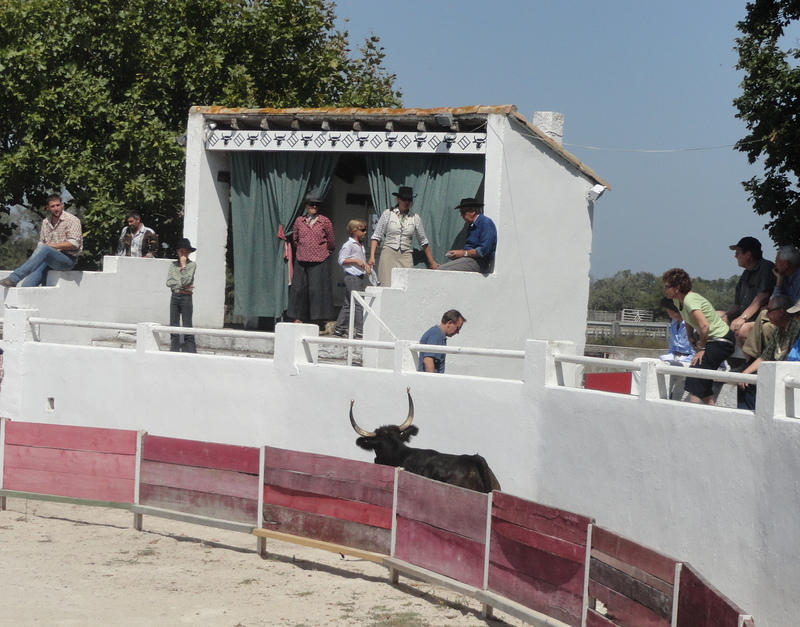 Everyone cheered her “victory” as the bull turned for a razetour who again jumped the fence to hang on the arena wall. But this time, the bull came right after him and jumped the 40-inch fence. 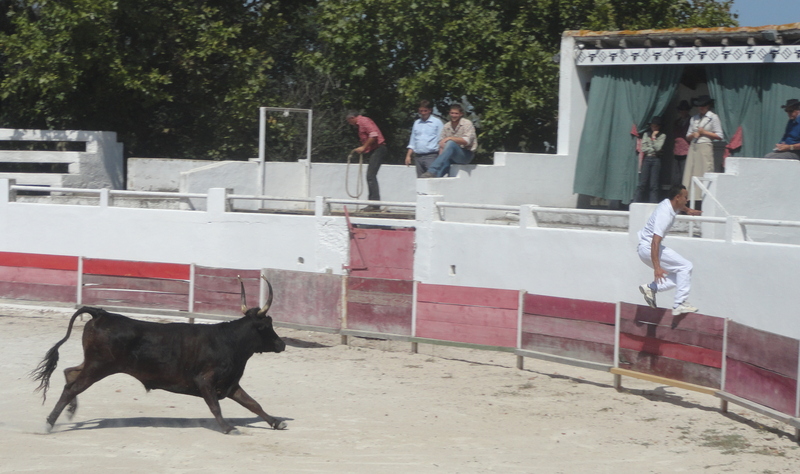 The crowd roared as the bull’s front legs cleared the fence but the back legs didn’t. After several wiggles of those legs and body, the bull had all 4 feet on the ground. And, the crowd applauded him. 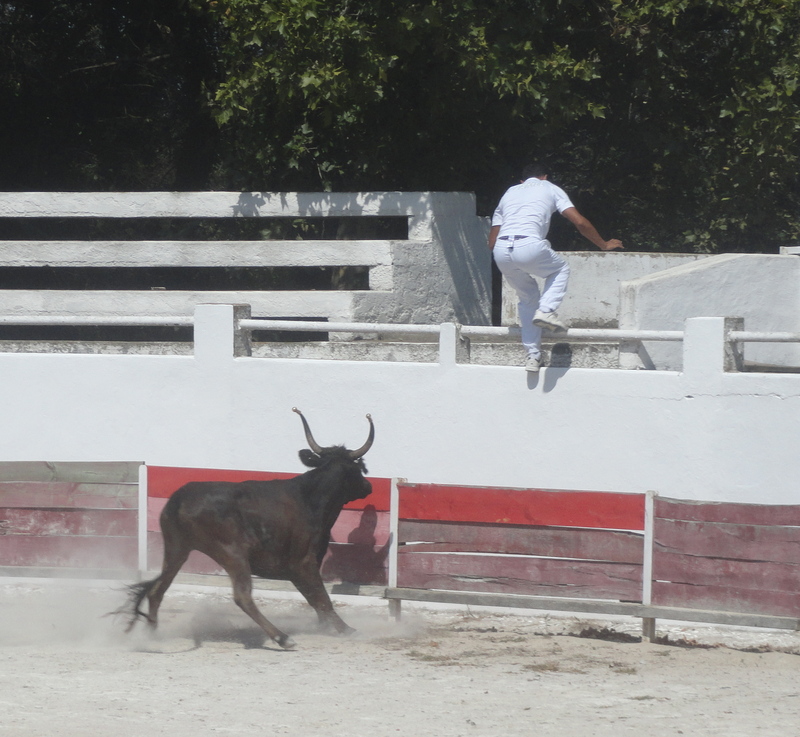 This bull continued to chase a razetour and the bull continued to jump the arena fence. And the crowed made funny macho comments and roared every time. 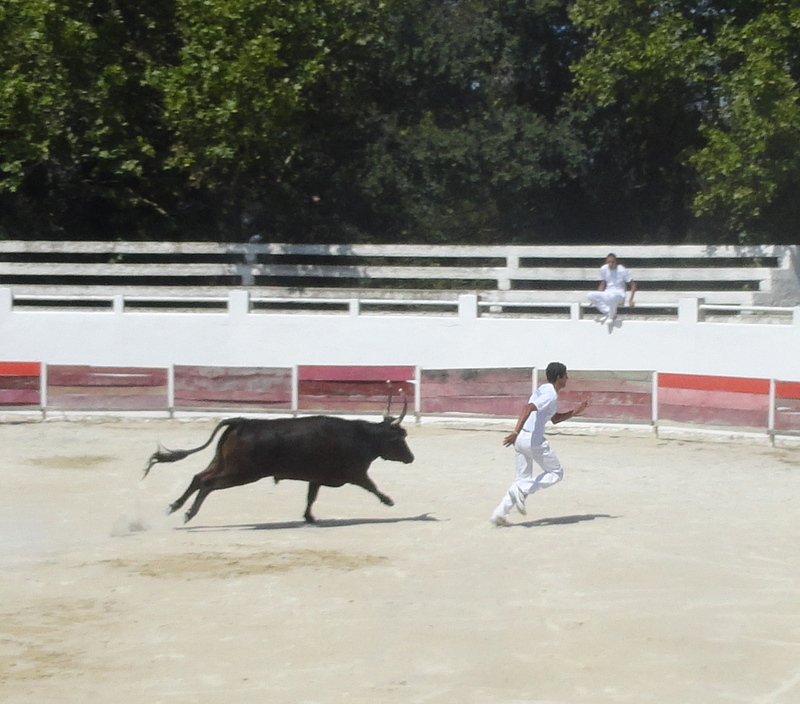 This bullfighting, French style, where the bull is used for entertainment, was a great show for the audience. came too and then took off after another razetour. The crowd went wild. So the French bullfight was a win, win, win. The razetour lived to see another day, the bull lived to see another day and the Tauck River Cruising audience had a roaring good time watching.